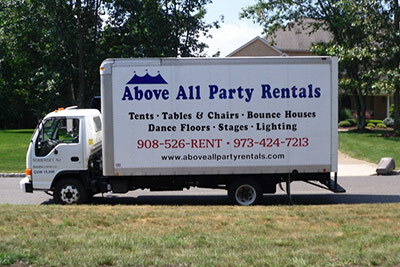 Since 2010, Above All Party Rentals has been providing party equipment rental services throughout New Jersey! We are a family-owned business with over 10 years of experience, and our professional staff takes pride in providing our customers with the newest, cleanest and most attractive equipment available. If you’re throwing a party—no matter how big or small—it’s important that you have the right party rentals in New Jersey to ensure everyone is having a great time at your event. Above All Party Rentals is here to offer you a wide inventory of rental options, from the basics to more lavish options, to ensure the enjoyment of your event by all in attendance. We’ve got tables, chairs, linens and tent rentals in New Jersey to furnish any sized party, as well as bounce houses, dunk tanks, concessions, bars, audio, visual and more! And, you can be sure that any rental item is of the highest caliber of quality. We’re a family-owned and –operated business. We have more than a decade of experience in the party rental and planning business. We’re pleased to serve greater New Jersey. All of our bouncy houses are State-Inspected, to ensure their integrity and safety.